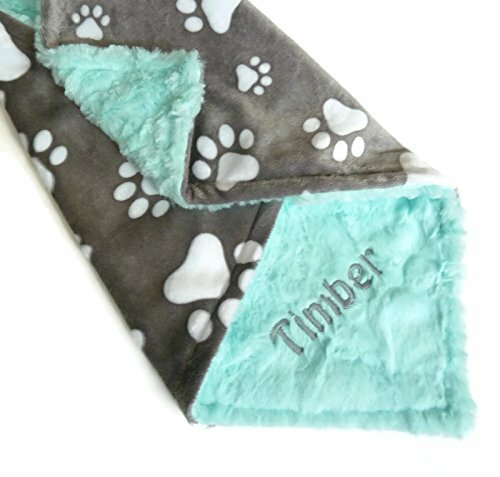 Front print is the Gray Paw Print minky Blanket is backed with a Solid Color minky of your choice. Color options can be seen in the last picture on this listing. The Solid color pictured is Saltwater Marble. If no Color is chosen the color pictured will be used. Blanket is embroidered with baby's name. Choose your size and name. Please double check the size to confirm you are getting the size you want. Machine wash cold, tumble dry low. No fabric softeners and do not iron minky. Please Note: The $20 Lovey (15x18") size blanket is for About the size of hand towel. It would be ideal for small caged animals, teacup size dogs, or as puppy scent blankets.